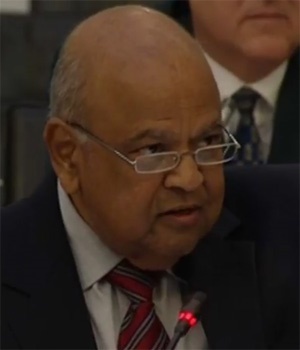 Cape Town - Former Finance Minister Pravin Gordhan has said his former Cabinet colleague Minister of Public Enterprises Lynne Brown's only answer to state capture allegations is "denial, denial, denial", as Parliament’s Eskom inquiry again continued late into the night. Gordhan, an ANC MP and a member of the public enterprises oversight committee, was questioning Brown late on Wednesday night on allegations of state capture and Gupta influence at state power utility Eskom, which falls under her watch. Brown had earlier denied that members of the Gupta family - or anyone else - influenced her decision-making as minister of public enterprises. She had also told the committee that firms connected with the Gupta family had not been blacklisted by the state. “So on the one side of the scale we have all the coal purchase controversies, the IT systems controversies, boards that are dominated by Gupta-linked people, suspensions of officials who are actually innocent, eventually, and the one who is actually implicated gets redeemed and comes back into Eskom," said Gordhan. “You have problems with chairs, particularly Mr (Zola) Tsotsi, we have the articulation of section 217 of the Constitution on procurement as an important value system, if you like, that we need to subscribe to, but everything that we do seems to be violating that systematically. “We say that we want more black companies to actually benefit from deals that Eskom makes, and yet a prominent and fairly large black listed company Exxaro - and I hope the evidence leader will bring us that evidence - is being victimised at the moment, according the information that I have. “You have the Dentons report - the Dentons report was firstly locked up, Mr (Brian) Molefe doesn't read it, although he is the chief executive who should actually implement the Dentons report, you have the ‘threat’ issued to Mr Tsotsi, you have the R1.6bn illegal guarantee given by the CFO of Eskom Mr (Anoj) Singh. “You have the Denel chair - who actually attacked the National Treasury and the then minister publicly and there was no reprimand, but it is not surprising because he is listed in the Gupta emails as well. “You have the prepayment that Mr Singh agreed to which eventually was used to buy these Optimum Holdings of some R600m. You have a fine of R2.1bn as we have heard on that mine reduced to R600m once Tegeta takes over those mines. You have the locomotive deal - all of that is evidence on one side,” said Gordhan. The statement ended Gordhan’s allotted time, and Brown was not asked to reply to what he had said. Earlier Gordhan - who was replaced as finance minister by Malusi Gigaba (former home affairs minister and public enterprises minister before that) in late March - had asked Brown whether she believed that the prosecuting authority was “captured” in a testy exchange. This occurred during a back and forth about the fact that Gupta-linked firms had not been blacklisted from doing business with the state. “Are you aware minister that in terms of the procurement legislation that a company or entity can only be blacklisted once there is a court decision that can be done?” asked Gordhan. “I am sure that is your opinion Mr Gordhan,” replied Brown. “No it is, I am asking you whether you agree with me?” said Gordhan. Brown said she did not. Brown, meanwhile, started her testimony on Wednesday with a stringent denial that she consulted with members of the Gupta family before making decisions. This after former Eskom chairperson Zola Tsotsi had testified earlier in the day that Tony Gupta and Gupta business partner Salim Essa had worked with Brown to compile a list of board members that Tsotsi had the responsibility of appointing to head various committees on the Eskom board. Tsotsi had alleged that, when he went to Brown’s house to finalise the list in December 2014, he had found Tony Gupta and Essa in her home. “I have never consulted with anyone on my executive functions. Not Tony Gupta or Salim Essa or anyone else. Why would I hand over my functions to anyone else?” said Brown. Brown also found fault with the committee for not giving her the opportunity to cross-examine witnesses who had testified. Speaking from her prepared notes, she said that even “mass murderers and rapists are entitled to be informed of allegations witnesses will make against them in order to defend themselves". “They are entitled to cross-examine those making allegations against them. But not Eskom nor the DPE (Department of Public Enterprises)," she said. Later, she reiterated to the DA’s Natasha Mazzone that she had a right to ask questions of the people who brought up her name in the committee. “I have come here, I am not in any way not wanting to participate, and I do have a right to ask whatever questions I needed to ask, and I feel that somehow the committee feels I am trying to muzzle them,” she said. She also added that she felt offended by some of the testimony that the committee had heard. The inquiry is set to continue on Thursday at 14:00.